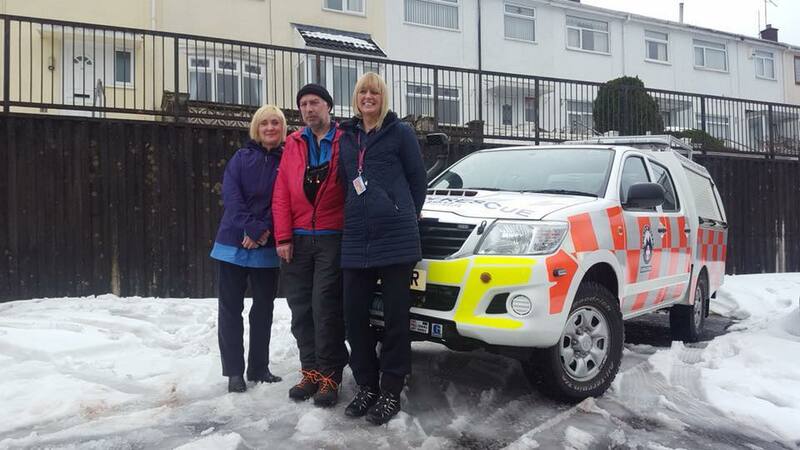 As much of the UK was affected by The Beast from the East & storm Emma, Mountain Rescue Teams across the country were on call to assist our local communities. From Thursday 1st March to Saturday 3rd, CBMRT provided around the clock shifts of up to 12 team members with our on-loan 4×4 vehicles. Additionally, 2 members in the Cardiff area supported the transportation of nurses across the city. The number of people we helped during the 3 days is well over 100. We also supplied team members to assist Brecon Mountain Rescue Team colleagues with two incidents in the Brecon Beacons. Pictured here are our team members Mike and Keith with the District/Community Nurses who were transported to their patients on our last shift this morning. Families of team members for your support and understanding. Team members for being out hours on end in the most severe conditions we’ve experienced for many years. Also to team members who were frustratingly available and willing to turn out yet unable to because of road conditions. To all of our supporters and followers for your words of support, gratitude and encouragement, it really does help! This activity has been additionally challenging against the background of our base being out of action since the devastating fire just before Christmas. Recovery project activity has been moved to one side for us to use the time providing the service through the snow and we now look to get that back on track. Many have asked how help can be provided, you can donate using the link below.